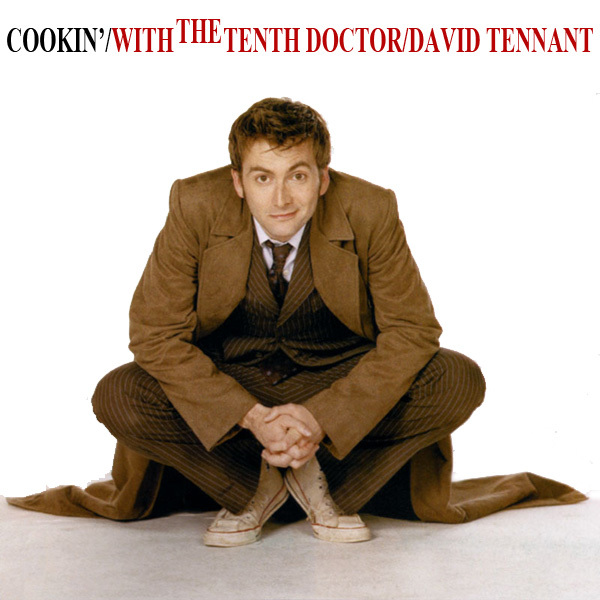 Doctor Who: Cookin' With The Tenth Doctor | Warped Factor - Words in the Key of Geek. As we look back on Russell T Davies cookin' up a new dawn for Doctor Who, so soon after the first strains of rebirth came to an end with the announcement that Christopher Eccleston was abandoning the TARDIS once his first & only series as the Ninth Doctor was at an end, it seems only too fitting that we consider a perhaps surprising influence on David Tennant's look as the new Tenth incarnation. For does not the wardrobe of the Time Lord say a lot about whichever body it seems to be clothing throughout his long run of all time & space?.. "I rang Russell and said: “Could we do this for the Doctor? They wanted me in stompy posh boots but the trainers were the thing I did go to the wall on." The moment of triumph of course coming in shedding his old self's leather jacket & finding himself all over again as he has following every such change of face & personality. That is, after a spell in his jim-jams saving the Earth from the Sycorax! From New Earth onwards the suit stayed. "I had always wanted a long coat because you've kind of got to." Wardrobe sorted, it was time for David to prove his fan credentials as one of our own seized the day. Eagle-eyed Series One viewers will spot that his predecessor was always credited as Doctor Who, as was every pre-Peter Davison actor to set foot inside the by now coral-interiored TARDIS. 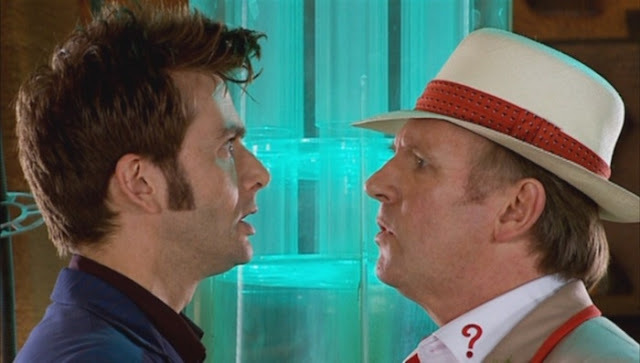 But just as Davison had, Tennant also insisted that he be referred to as simply the Doctor. The trainers & "brainy specs" were also inspired by the Fifth Doctor, who would of course later become Tennant's father in law. "Tennant's tall, lean frame and angular features, offset by a precipitous quiff and slightly dishevelled suits, brought with it a kinetic energy. 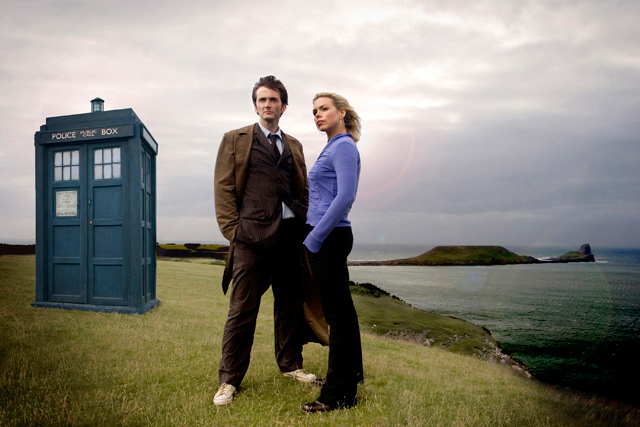 Occasional glimpses of vulnerability suggested a loneliness (let's not forget he is 900 years old and the last of the Time Lords), which won him a legion of female fans - who seem to particularly adore those big brown eyes - desperate for the love story between the Doctor and Rose to be realised." Dishevelled suits are of course nothing new in Doctor Who - just look at Patrick Troughton & his Chaplinesque get-up. But the angle of an implied something more between Doctor & companion was rather more daring, perhaps made permissible by the 1996 Eighth Doctor TV movie & that snog between he & Grace. Ten years later he'd be two selves older & even better acquainted with that sort of thing, his previous hint at dancing made real in a sense by the penmanship of one Steven Moffatt. A liason with Madame de Pompadour suggests that showrunner Davies was really cookin' with gas (similar to his near namesake, jazzman Miles Davis, on the record from which the title of this piece is lovingly pinched) and itching to take the by now 900-ish year old Doctor into a more adult realm. Makes his initial wooing of Cameca all those years ago seem just a little tame perhaps. No pussyfooting for the lonely god, though! REINETTE: A door, once opened, can be stepped through in either direction. Oh, Doctor. My lonely Doctor. Dance with me. DOCTOR: This is the night you dance with the King. REINETTE: Then first, I shall make him jealous. REINETTE: Doctor. Doctor who? It's more than just a secret, isn't it? DOCTOR: What did you see? REINETTE: That there comes a time, Time Lord, when every lonely little boy must learn how to dance. By then he had of course danced across the universe with Rose, whom he would of course have to say goodbye to at the conclusion of Doomsday. MARTHA: So, who's going where? I mean, there's only one bed. DOCTOR: We'll manage. Come on. Those more schooled in the art of seduction would have known that what he was really missing, as hinted at in a tell-tale line from Gareth Roberts' The Shakespeare Code, was a blindingly obvious hint that his newest companion might have wanted more from her first trip in the universe's oldest police box than just a chance to visit the past! Proof that no matter how trendy the threads & romantic the implications, once an alien, always an alien?